More than 100 participants took part in the Day of Champions Camp. The months of July and August typically are some of the hottest months to be outside in Oklahoma, but the high temperatures didn’t stop an active summer season for many local youth who participated in sports camps around the Citizen Potawatomi Nation the past few months. Following immediately after the CPN Family Reunion Festival, the Day of Champions Football and Sports Skills Camp celebrated its thirteenth year at the Nation. 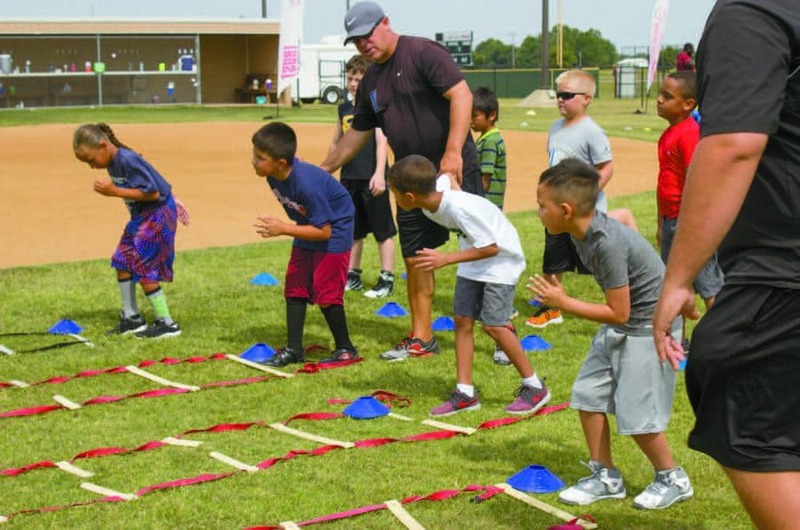 Open to tribal members and children of tribal employees, the camp is put on by Day of Champions Inc., founded by former collegiate football coach Ken Heupel and University of Oklahoma National Champion Josh Heupel. This year 104 participants took part in the football and sports skills activities, which included softball instruction, during the two day camp. Of that total, 85 percent were members of federally recognized tribal nations, while 32 campers this year were female. CPN Personal Trainer Sarah Lawerance helps organize the camp with Day of Champions Inc. and explained the lessons that are taught there are intended to extend off the field. A core curriculum is emphasized with each sports drill that campers go through, led by high school, collegiate and professional coaches at the camp. Campers are instructed on how to identify and address bullying, learning why asking “why?” is important, healthy eating and nutrition tips and an emphasis on manners are just a few of the areas that are covered. In addition to subsidizing the cost for campers and providing the use of FireLake Ball Fields for its use, CPN Health Service medical staff was on hand both days to ensure the wellness of participants and coaches. District 4 Legislator Jon Boursaw, a historian and former head of the CPN Cultural Heritage Center, also gave a brief presentation of the history of the tribe to coaches at a dinner hosted by FireLake Golf Course. District 11 Legislator David Barrett, also a member of the CPN Veterans Organization, later presented Coach Ken Heupel with a commemorative coin from the tribal military service vets in thanks to his work in hosting Day of Champions over the years. Lawerance, who helped bring Day of Champions to CPN more than a decade ago, reflected on the experience of her son, a former camper. In its inaugural year, FireLake Arena’s Sports Camps provided youth interested in a wide array of sports the opportunity to hone their skills. Led by FireLake Arena Sports Manager Darin Green, camps ranging from basketball, wrestling, golf and dancing brought local youth from around Pottawatomie County to CPN for low cost, sports camps. Tribal facilities hosted campers from ages six to 15 years of age, while tribal personnel and outside coaches and instructors taught fundamentals of the sports and activities each week. Greene even incorporated the specialties of various coaches and instructors from the Citizen Potawatomi Nation when possible, with tribal member Kaylee Morrison leading the dance camp at FireLake Arena in early July. Staff from FireLake Golf Course, including club pro Chris Chesser, led golf instruction. The camps were a start for FireLake Arena, with the sports division planning on hosting an increasing number of events in the future including adult dodgeball tournaments, three-on-three basketball tournaments for youth and adults and both collegiate and high school basketball and wrestling tournaments. Look for more information at www.Facebook.com/FireLakeArena. Qualifying youth from local schools in the tribe’s service area in east central Oklahoma are selected each year to take part in the CPN Johnson O’Malley Youth Camps conducted by the Citizen Potawatomi Nation Workforce & Social Services Department. Johnson O’Malley is a federal grant program for federally recognized Native Americans and it helps native students the same opportunities as their classmates in school. Citizen Potawatomi Nation’s program serves 12 school districts. JOM campers this year received golfing lessons from instructors from the CPN Wellness Center and FireLake Golf Course before enjoying some time at the CPN Powwow Grounds Swimming Pool to beat the July heat. In other activities, CPN Diabetes Program from the wellness center conducted cooking demonstrations to instruct the youth how to prepare healthier snack and dinner options at home. Though the summer camp aspect of the program is led by the tribe in July, the Johnson O’Malley funding may go to a wide range of activities for qualifying youth while funds last throughout the year. To learn more about the program, visit http://cpn.news/CPNJOM.